So, kinda in honor of just picking up Uprooted . . . which should be arriving in thirty seconds or so given the magic of electrons . 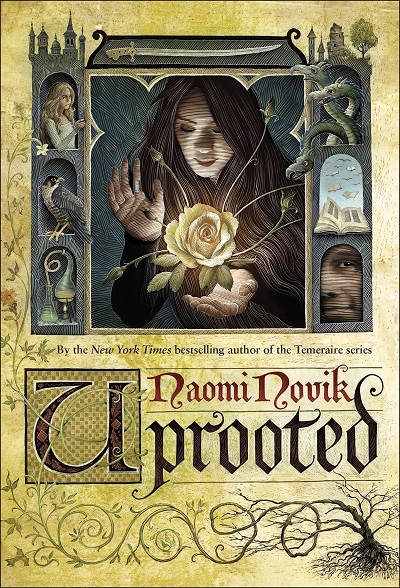 . . let me draw you to this guest post by Naomi Novik over at Fantasy Book Café. Now, I know that I am always saying that Everybody’s Experience is Different. But THIS IS SO TRUE. It is almost funny how much I can dislike working on some books/parts of books versus how compulsive working on other books/parts of books can be. Yes, I have been in both states for long periods. No, the various books are not distinguishable on the basis of whether I loved working on them or not. What’s also interesting is that for Novik, interruptions can apparently kill flow. For me, not so much. I guess for me it more depends on whether I’m living in the story or not. Many books switch partway through: the first quarter is easy, the next half is murder, the back quarter is compulsive. But there’s so been so much variance now that I don’t count on that pattern. Anyway, if you, like me, have been looking forward to Uprotted *sigh* Uprooted (as more than one of you noticed) more than just about any book due out this year, then if you have a minute you can click through and read the whole thing. I realise that it is just a typo, but “Uprotted” from your last sentence above would make a fantastic title for a zombie novel. Perhaps a novel about zombies being raised to sentience a la David Brin? I am also desperately waiting for my copy of UPROOTED. One of my very dear friends is a graphic artist and dose freelance on the side of her normal job and I know she sometimes gets more work than she can handle but to my knowledge she is next more that a day or two behind a deadline….if you need someone else next time let me know, she is crazy talented. I will probable look into Uprooted later this summer but I’m trying not to pick up too many new books/series/authors to prevent any more delay of grad work than I already am doing, lol. AARGH I KNOW. I am now seeing drafts for the cover and I think it will be done very soon. I don’t believe I was clear enough about specifying a definite due-by date — and to be fair, the artist’s father had surgery and that’s the sort of complication one has to be tolerant about. Also, I know about trying not to pick up too many books! For me it’s hopeless, but lots and lots of them sit *forever* on my Kindle or TBR shelves before I have time to get to them. Procrastination on the WIP is just like procrastination on grad school work, I find.